Do you dream about going on a family ski holiday with your family, but are worried about if it’s the right kind of holiday for your children? Choosing the right ski resort is the key to success, and will allow you to enjoy a stress-free, safe and action-packed vacation with the whole family, even your littlest ones. Many ski resorts put a lot of effort into catering for all ages, with facilities and activities for toddlers, children, teenagers and adults, and not everything is about skiing. 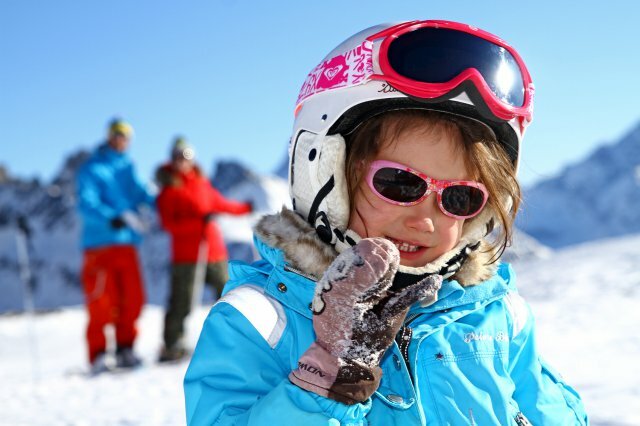 We’ve put together our list of top French ski resorts for families with younger children (mainly between the ages of 1-11 years). With mysterious and enchanting forests, authentic chalets and beautiful panoramas, Méribel is the perfect place to make life-long memories. Your children can find their snowfeet in the ‘Magic Garden’, where they will learn and play in a safe environment, with games, treasure hunts and fun activities. You can rest assured knowing they are in safe hands; you will be able to explore what the greater mountain has to offer, or relax in one of the resorts many spa and wellness facilities. For children under 3 years that are generally too little to try skiing, there are plenty of trusted childcare and nanny options, but should all be booked well in advance. There are a number of fun snow-parks where your children can follow the forest in search for the life-size animal models, explore caves and tunnels, and go sledging. You can also visit the Inuit Village, where you will find children’s entertainers, a climbing web, swings and exciting games. The ski resort of Avoriaz is home to the well-loved Village des Enfants, approved by the Juenesse & Sport government ministry. It welcomes children from the age of 3 from 9:00am until 5:30pm each day, with more than 100 instructors and supervisors who will teach and play with them in a safe, monitored environment. There is also a selection of additional snow fun activities, such as dog sledding, horse-drawn sleigh rides, snowshoeing, human bowling and snowball fights (probably more suitable for the older children). Off the slopes, you can visit the Aquariaz indoor and outdoor waterpark featuring a river with varying current, a sidewinder, a water playhouse, a climbing wall and chill-out spaces. It uses a beautiful ‘natural tropical vegetation’ theme in mountain surroundings, with rocks and plants. Arc 1950 is always filled with families enjoying their holiday in a social village environment. On check-in day (Saturday), the resort brings out their collection of inflatables so your children can play whilst you are busy checking in. Why not book a family private lesson with an instructor, where even children under 3 can have a go at skiing? Alternatively, children’s group lessons for 3 to 4 year olds are usually taught in a snow garden, and 5 years and older tend to be taught on the gentle gradient slopes – both supervised by experienced instructors. Courchevel is home to a fun themed Indian Trail, which means you and your family can explore the hidden canyons of the Indians and find yourself at their base camp of teepees. You can also discover the land of Cowboys and Indians on your skis with its wide, gentle runs accessed by a number of magic carpets. At the adventure camp, children from 6 years can try out a variety of on-snow vehicles including a snowmobile or a sledge. In heart of Courchevel, you will find Aquamotion, which is one of the biggest developments to happen for non-skiers to date. The enormous building encompasses indoor pools, outdoor pools, river rapid slides, diving pools, saunas, steam rooms, salt pools, hot tubs, and massage booths – something for all ages. The resort of Les Deux Alpes is perfect for both skiers and non-skiers, making it a perfect location for the whole family to enjoy. They have plenty of activities for your young ones, including dodgems on ice on Tuesdays and Thursdays, an outdoor swimming pool (heated, of course) and family walks to the ice caves. The Bonhomme de Neige building in the centre of the resort is home to three separate childcare facilities which are a crèche, a nursery and a leisure centre which organised a range of fun activities whilst you can spend your time on the slopes. From the age of 1, children can experience sliding on the snow with the ‘Baby Snow’ device invented by one of Les Deux Alpes’ instructors. For older children, they can try a risk-free jump with a big air snow-bag, ride a Segway, experience a simulated avalanche in the robocoaster, or drive a mini snowmobile. Choosing France for your family ski holiday is a better option for those with young children, especially for travellers coming from the UK. The French Alps are only a short journey from Calais for those venturing on self-drive ski holidays, or for those flying, there are a number of airports in the Alps for you to choose from. With only a short transfer to each resort, you will be at your destination in no-time.